5th Annual Adult Easter Egg Hunt - Go Foxburg! The hunt is on! If you’re looking for a fun event for Easter weekend which gets you outside, on the move and winning prizes, then join us for the 5th Annual Adult Easter Egg Hunt in downtown Foxburg – rain, shine, or snow! Since 2014, hundreds of participants have gathered between the slopes of the Allegheny-Clarion valley to support local non-profit organizations while having good old fashioned fun. Treasures hidden in colorful eggs speckle the grounds of downtown Foxburg presenting participants, a.k.a. “Eggers”, chances to win grand prize drawings for gift baskets filled with goodies, plus valuable coupons and trinkets from multiple river valley businesses. There will be hundreds of dollars worth of prizes to be won, but best of all, it’s just an all out good time! 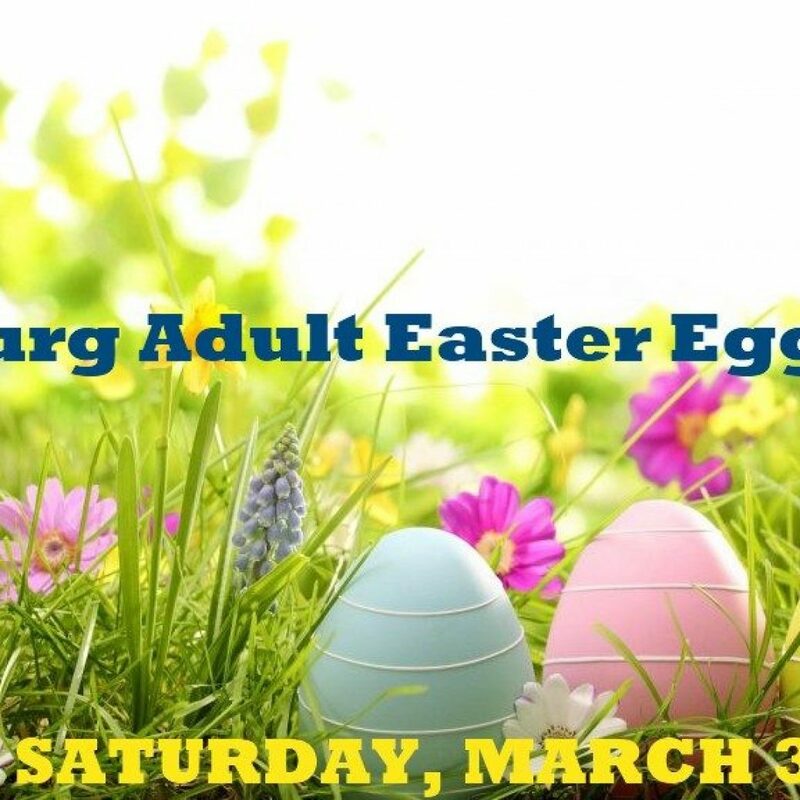 Foxburg Adult Easter Egg Hunt Online Registration Is Now Closed. The hunt will begin promptly at 10:00 AM, right after signing up at the registration desk in front of the Foxburg Library. You may also save time at the event by registering All participants are asked to contribute $5 donation to benefit both Emlenton and Parker volunteer fire departments. Since some of the prizes and coupons are alcohol related all Eggers must be 21 years of age or over. Seniors over 65 and visibly pregnant women will get a 10 second head start. Egg hunt will last for an hour or as long as the supply of eggs last. The hunt will occur in spite of inclement weather so, in case of less than sunny skies, be sure to bring umbrellas and rain gear. All drawings will be held around 11:00 AM in front of the Library, so be sure to stick around to see if you’ll be a lucky winner! Follow our facebook page for more info and updates on this event.